Ilya Somin is Professor of Law at George Mason University School of Law. His research focuses on constitutional law, property law, and the study of popular political participation and its implications for constitutional democracy. He is the author of The Grasping Hand: Kelo v. City of New London and the Limits of Eminent Domain (University of Chicago Press, forthcoming), and Democracy and Political Ignorance: Why Smaller Government is Smarter (Stanford University Press, 2013), and coauthor of A Conspiracy Against Obamacare: The Volokh Conspiracy and the Health Care Case (Palgrave Macmillan, 2013). This is a guest post by Ilya Somin, a Professor of Law at George Mason University and a blogger at The Volokh Conspiracy (posts by Somin only). He is the author of Democracy and Political Ignorance: Why Smaller Government is Smarter. A list of some of his writings relevant to open borders can be found at the Open Borders page about Somin. Somin has also written on the relation between foot voting and political freedom (see here) and he draws upon that work in this blog post. His previous guest post for the site was about immigration and the US constitution. There is widespread agreement that political freedom is a fundamental human right – that everyone is entitled to substantial freedom of choice in deciding what type of government policies they will live under. This is one of the main justifications for democracy. Voting enables the people to exercise political choice. But the principle of political freedom also has implications for international migration. The same logic that justifies giving people a right to vote at the ballot box also implies that they should have a right to vote with their feet. This is particularly true of people living under authoritarian governments, where foot voting is often the only feasible way of exercising any political choice at all. But even for those fortunate enough to live under a democracy, the right to migrate elsewhere is an important aspect of political freedom. In both cases, obviously, the right to emigrate is of little value unless there is also a right to immigrate to some other nation. I. Political Freedom and Migration Rights for People Living Under Authoritarian Regimes. Although the democracy has spread rapidly in recent decades, the majority of the world’s population still live in undemocratic states. According to Freedom House, almost 2.4 billion of the world’s 7 billion people live in nations that are “not free” at all in political terms, while another 1.6 billion live in “partly free” countries that have some semblance of democracy, but also place severe restrictions on political rights such as freedom of speech or the right to form opposition parties. These figures are surely imperfect. But there is no doubt that hundreds of millions of people languish in authoritarian and partially authoritarian societies where there is little or no meaningful democratic political process. For most such people, emigration is their only practical way to exercise political freedom in the sense of the ability to choose the government policies they live under. One can object that they should instead work to democratize their home societies. In many cases, however, such efforts are both highly unlikely to succeed and dangerous for those who attempt them. Many authoritarian regimes repress dissenters ruthlessly, imprisoning or even killing them. We rightly admire the Vaclav Havels and Nelson Mandelas who bravely seek to transform oppressive regimes. But it is understandable that most subjects of such governments are unwilling to run such enormous risks. Moreover, in many oppressive societies, no amount of effort and courage is likely to succeed in establishing a functional democracy in the foreseeable future. Such societies lack the economic or cultural preconditions for the establishment of liberal democracy. Residents of many authoritarian nations can exercise political freedom only through international migration or not at all. If developed democracies refuse admission to migrants from such countries, they effectively deprive them of their political freedom. They therefore become complicit in violating a fundamental human right. One can object that Westerners are not responsible for the lack of democracy in many Third World nations. But as philosopher Michael Huemer explains, immigration restrictions don’t merely leave in place poor conditions created by others. They involve the active use of force to prevent people from bettering their condition through voluntary transactions. If I forcibly prevent a starving man from purchasing food, I bear moral responsibility for his resulting death, even if it is not my fault that he was starving in the first place. Similarly, those who use force to prevent the exercise of political freedom through migration are partially responsible for would-be immigrants’ political oppression, even if they had nothing to do with establishing undemocratic governments in the migrants’ homelands. Deprivation of political freedom is far from the only wrong inflicted by immigration restrictions that prevent people from fleeing oppressive regimes. Such people are also often forced to endure a variety of other human rights violations, as well as severe poverty. But the loss of political freedom is an important additional strike against immigration restrictions, one that is usually ignored even by most advocates for migration rights. II. Migration and Political Freedom for Citizens of Democracies. Residents of democratic nations generally have much greater political freedom than those who live under authoritarian rulers. But even in the best-functioning democracies, the freedom provided by the franchise is distinctly limited. Any individual voter has only an infinitesmal chance of making a decisive difference in an election – about 1 in 60 million in a US presidential race, for example. We would not say that person enjoys adequate religious freedom if he has only a 1 in 60 million chance to determine his religion. We would not say that he has freedom of speech if he has only a 1 in 60 million chance to determine what he can say or write. Similarly, a 1 in 60 million chance at political freedom is far from sufficient. In many democracies, voters’ already miniscule chance of making a difference is further undermined by institutional corruption, “capture” of the political process by narrow interest groups, and other forces that make it harder for the electorate to influence government policy. By contrast, migration rights enable individuals to have a genuinely decisive say in choosing the policies they wish to live under. An individual or family can migrate from one nation to another regardless of whether millions of others agree with the decision or not; or at least they can if governments do not use force to prevent it. And, unlike ballot box voters, migrants who “vote with their feet” have strong incentives to acquire adequate information about their decision, and use it wisely. While liberal democracies do not differ from each other as starkly as from authoritarian states, there is still substantial policy divergence between them on issues as varied as health care, economic regulation, land use policy, education, taxation, and law enforcement policy. That creates opportunities for meaningful international foot voting. Where governments permit it, many people already vote with their feet for such reasons. None of this suggests that the ballot is utterly worthless. Democratic elections are often an important check on abuses of government power. But they are not enough to give individuals meaningful political freedom. That goal can only be achieved by giving people the power to “vote with their feet” as well as at the ballot box. Even for citizens of democratic states, political freedom is greatly enhanced by having the right to migrate to other nations. Even in the absence of restrictive immigration policies, not everyone can effectively use international migration to enhance their political freedom. For many, the costs of moving are likely to be too great. Others are unable to make the adjustment to living in a society with different language or culture. Nonetheless, freer international migration could greatly increase political freedom for millions of people, even if it is not a complete solution for the problem of political oppression. III. What About the Political Freedom of Citizens of Receiving Nations? Immigration restrictionists might object to the above argument on the grounds that it ignores the political freedom of citizens of receiving countries. If they have to accept immigrants they may not want, that might vitiate their own freedom to choose their government’s policies. The new migrants could, for example, vote for policies that are inimical to the interests of natives. There may indeed be cases where the harms inflicted by immigration on natives are grave enough to justify restrictions on immigration. The political freedom of potential migrants is not an absolute right that always trumps all other considerations. But in the vast majority of situations, any such harms can be dealt with by “keyhole solutions” less draconian than excluding migrants, and forcibly consigning many of them to lives of poverty and political oppression. For example, the obvious remedy for concerns that immigrant voters will undermine the political freedom of natives is to have a long waiting period before immigrants are allowed to gain the franchise or – in extreme cases – even deny them the vote entirely. Living in a nation without voting rights may be unjust to immigrants. But, in many cases, it will still be far better than being forcibly consigned to poverty and political oppression in their home countries. At the very least, their political freedom is enhanced by having the right to make the choice between the two for themselves. There are also a variety of other possible solutions for potential “political externalities” of immigration. Restrictionists could still argue that denial of the ability to exclude migrants undermines the political freedom of natives even if immigration does not lead to objectionable changes in other government policies. But the right to political freedom surely cannot encompass the power to complete destroy the political freedom of others, as happens when residents of authoritarian states are denied the only means by which they can exercise any political choice at all. That is like saying that the right to religious freedom includes a right to force others to practice your own preferred faith if you believe God commands you to forcibly convert infidels. Moreover, any reduction in natives’ political freedom caused by an inability to exclude migrants irrespective of their influence on other policies is minor compared to that suffered by potential migrants who are trapped in authoritarian states by restrictionist policies. Even in cases where immigration does cause some harm that cannot be alleviated by keyhole solutions, any such harm must be weighed against the many wrongs caused by immigration restrictions themselves. Political freedom should be an important factor in any such analysis. It certainly is not the only issue that must be weighed in debates over immigration policy. But it is a major and oft-ignored consideration tipping the scales towards broader migration rights. This is a guest post by Ilya Somin, a professor of law at George Mason University and blogger at The Volokh Conspiracy (posts by Somin only). Somin has argued for substantially freer immigration, particularly in the context of immigration to the United States, on both moral and practical grounds. A list of some of his writings relevant to open borders can be found at the Open Borders page about Somin. The US Constitution does not in itself tell us what kind of immigration policy is right and just. But it is relevant to debates over immigration in at least three important ways. First, some opponents of increased immigration mistakenly argue that the Preamble and other parts of the Constitution commit the US government to ignoring the potential benefits of immigration to would-be migrants themselves. Second, there is a strong case that the original meaning of the Constitution restricts Congress’ power to limit migration, though it does give Congress broad power to deny citizenship to migrants. Finally, some structural aspects of the Constitution help limit the potential “political externalities” of open immigration, thereby weakening claims that the only way to prevent immigrants from having negative effects on public policy is to keep them out of the country entirely. I. The Constitution does not Justify Ignoring the Benefits of Immigration for Immigrants. The Preamble to the Constitution states that the document’s purpose is to “form a more perfect Union, establish Justice, insure domestic Tranquility, provide for the common defence, promote the general Welfare, and secure the Blessings of Liberty to ourselves and our Posterity.” Some opponents of immigration claim that the inclusion of the phrase “ourselves and our posterity” suggests that the Constitution was only meant to benefit present US citizens and their descendants, thereby justifying the US government in ignoring the rights and welfare of potential migrants in making decisions on immigration policy. However, the term “posterity,” as used in the Preamble, is probably metaphorical rather than literal – denoting future residents of the United States in general rather than merely just those who were citizens in 1787 and their descendants. In the 18th century, as today, the word “posterity” was often used to denote “future generations” in general rather than merely the biological descendants of a particular group of people. In 1787, and for almost a century thereafter, the US had a virtual open borders policy, and the Framers of the Constitution had no intention of changing that. They knew that millions of immigrants would be among the “posterity” referred to in the Preamble. Even if we assume that the “posterity” referred to in the Preamble really does refer only to those who were citizens in 1787 and their descendants, it does not follow that that the Constitution justifies ignoring the effects of immigration restrictions on would-be immigrants. As the Founding Fathers well knew, there are moral limits on what governments are allowed to do in pursuit of the interests of their citizens. For example, the United States has no right to invade Mexico and enslave its people – even if doing so would enhance “the general welfare” of Americans. Similarly, there are moral constraints on the extent to which the US government is justified in forcibly consigning would-be immigrants to lives of poverty and oppression in Third World countries. Neither the Preamble nor any other part of the Constitution states that the US government is entitled to ignore moral constraints on the means it uses to achieve the goals of the Constitution. A closely related restrictionist argument is the claim that aliens are not entitled to the various constitutional rights enumerated in the Constitution. In reality, most of the rights guaranteed by the Constitution are extended to all persons who enter areas governed by the United States, whether citizens or not. As James Madison put it at the Virginia ratifying convention for the Constitution, “[I]t does not follow, because aliens are not parties to the Constitution, as citizens are parties to it, that whilst they actually conform to it, they have no right to its protection.” In the few cases where the Constitution really does protect only citizens, the term “citizens” is explicitly used, as in the Privileges and Immunities Clause of Article IV, Section 2. Such explicit references to citizens would be unnecessary if there was an implicit understanding that all constitutional rights are limited to citizens alone. II. Congress’ Power to Restrict Immigration. The detailed enumeration of congressional powers in Article I of the Constitution does not include any power to restrict migration as such, even though it does include the power to make laws concerning the “naturalization” of foreigners and “regulate Commerce with foreign Nations.” The Naturalization Clause does not create a power to prevent foreigners from entering the country. It merely allows Congress to set conditions for the grant of citizenship. The scope of the power to regulate “commerce” has long been a source of controversy. But at the time of the Founding and for many decades thereafter, the dominant interpretation was that it merely gave Congress the power to restrict trade and other commercial transactions, not to forbid movement as such. The Commerce Clause also gives Congress the power to regulate interstate as well as international commerce. Yet few if any eighteenth and nineteenth century jurists would have argued that Congress therefore had the power to forbid Americans from moving from one state to another. In recent years, some leading legal scholars have argued that the original meaning of the Commerce Clause gives Congress the power to regulate all “social interaction” that affects multiple states or foreign nations. But this interpretation would give Congress nearly unlimited power, and is inconsistent with the dominant original understanding that congressional power was intended to be strictly limited in order to limit infringements on the power of the states. For a more detailed critique of the interaction theory, see this article by Georgetown law professor Randy Barnett. Congress can restrict the entry of some foreigners by using its other enumerated powers. For example, the power to declare war and to spend money for the “common defence” includes a power to forcibly restrict entry by enemy spies, terrorists, and soldiers. The power to “define and punish” offenses against “the law of nations” presumably allows Congress to restrict the movement of pirates and other violators of international law. But there is no general enumerated power giving Congress the authority to ban the entry of people simply because they are foreign nationals. Not until the Chinese Exclusion Act of 1882 did Congress adopt a significant law banning migration as such, as opposed to restricting eligibility for citizenship or excluding individuals who posed a specific threat that Congress could address under one of its other enumerated powers. And, even then, there was considerable controversy over the law’s constitutionality, despite the fact that the Act was popular due to widespread anti-Chinese prejudice. Finally, even if Congress does have the power to exclude migrants for any reason it wants, nothing in the Constitution requires it to do so. The Constitution allows federal and state governments to do many things that are ill-conceived or unjust, and large-scale restrictions on immigration could be among them. III. The Constitution and Potential Political Externalities of Immigration. Sophisticated critics of immigration – particularly conservative and libertarian ones – often emphasize the problem of “political externalities:” the danger that immigrants will use the power of the vote to cause harmful changes in government policy. Several parts of the Constitution help restrict such dangers. First, as noted above, the Naturalization Clause gives Congress the power to restrict migrants’ eligibility for citizenship. Under current law, most legal immigrants are eligible for citizenship only after five years, and only if they speak a modicum of English and can pass a citizenship test that many native-born Americans would fail. This ensures that immigrants will be at least partially assimilated before getting citizenship rights, and makes it less likely they would support laws that undermine core American values. If necessary, Congress could lengthen the waiting period for citizenship, make the test harder, or both. Living for many years in a nation that denies them citizenship rights may be unfair to immigrants. But most would prefer living as a non-citizen in a relatively free and prosperous society to life as a full citizen in poor and often oppressive Third World nations. Second, the Constitution’s requirement that each state has two senators leads to overrepresentation of states with small populations. Most such states are relatively rural states far from the East and West coasts, and they tend to have few immigrants. The resulting overrepresentation of native-born citizens diminishes the relative power of immigrant voters, and thereby helps alleviate any political externalities they might cause. The Constitution also restricts most powerful elected offices to citizens, and allows Congress to restrict non-citizen eligibility for federal welfare programs. The political effects of the Naturalization Clause and the Senate are double-edged swords. In some cases, immigrant voters might use their influence to improve American public policy rather than make it worse. When that happens, restrictions on eligibility for citizenship and overrepresentation of native-born citizens in the Senate turn out to be harmful rather than beneficial. But those who worry about the political externalities of immigration are likely to be pessimists rather than optimists in their assessment of the influence of of immigrant voters. Such pessimists should welcome the fact that the Constitution has many mechanisms for controlling such externalities without resorting the more draconian approach of banning migrants from entering in the first place, and thereby consigning many to a lifetime of misery in the Third World. I think his argument may well be correct. But if it is, I think it quite plainly leads to a result Professor Somin does not mention, and which the folks at Open Borders do not want hear: it would leave to the states the power to restrict immigration. I agree that the states had the power to restrict immigration under the original 1787 Constitution. But matters are far less clear after the Fourteenth Amendment, which, among other things, restricts state government discrimination against aliens. As the Supreme Court pointed out in Plyler v. Doe (admittedly in an opinion written by non-originalist Justice William Brennan), several of the framers of the Amendment specifically stated that one of its purposes was to curb such discrimination. But if it turns out that the price of limiting congressional power to restrict immigration is increasing state power to do so, that’s a tradeoff I’m more than happy to accept. Some states might choose to severely limit immigration, but – thanks to interjurisdictional competition – others will embrace it. And life in any American state is a far better deal for immigrants than being consigned to the Third World, which is the effect of federal laws banning migration. UPDATE #2: Michael Ramsey’s colleague and co-blogger Mike Rappaport comments on this post here. Mike agrees with me that “the Constitution does not give Congress the power to regulate immigration as such.” But he also argues that Congress does have the power to regulate some other types of international movement, such as crossing international boundaries for commercial purposes. I largely agree. But such restrictions are a far cry from being able to ban mere migration across international lines. Mike also raises the issue of state authority to impose migration, barriers, but concludes (as I do above) that state migration laws are unlikely to impede immigration as much as federal ones do, given interstate variation and competition. He does not address my point about the ways in which the Fourteenth Amendment might restrict state governments’ power to regulate migration. Finally, Mike suggests that if the Supreme Court had struck down the Chinese Exclusion Act in the 1880s, Congress might have been given the power to ban immigration by constitutional amendment. That is certainly possible. But the Constitution is extremely hard to amend, and it is far from clear that the supporters of the Exclusion Act had the necessary two-thirds majority in both houses of Congress, plus winning the support of three quarters of state legislatures. These links have been edited by the Open Borders: The Case editorial staff and were not vetted by the author. Other related material by the author: Obama, immigration, and the rule of law [updated with additional material on precedents for Obama’s action, and a response to Timothy Sandefur] by Ilya Somin, Volokh Conspiracy (Washington Post), November 20, 2014. The Constitution, Citizenism, and the Natural Right of Migration by Chris Hendrix, November 13, 2012. Constitutionally entrenching migration as a fundamental human right: Argentina and open borders by John Lee, November 25, 2014. Is There a Downside to Presidential Nullification? by Nathan Smith, June 19, 2012. Citizenism and open borders by Michael Huemer, February 18, 2013. Immigration to US for whites only? by Chris Hendrix, July 18, 2013. Obama November 2014 deferred action announcement, made November 20, 2014. This blog post received a lot of attention in the wake of the announcement. Obama June 2012 deferred action announcement (de facto DREAM Act), made June 15, 2012, the preceding major immigration announcement by Obama. 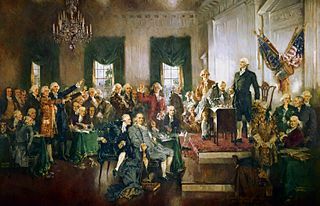 The painting featured at the top of this post depicts the signing of the United States Constitution, and is available in the public domain. Immigration and the US Constitution is licensed by Ilya Somin under a Creative Commons Attribution 3.0 Unported License.